Reviewing the year 2014, I can see that I have truly started improving my life by lowering the number of conferences attended & lowering the number of presentations delivered. I am also hoping that I have lowered the number of days that I have stayed away from my family. In total in the 2014 I have attended 14 conferences, 18 user group meetings & made 24 presentations (including 2 precons). 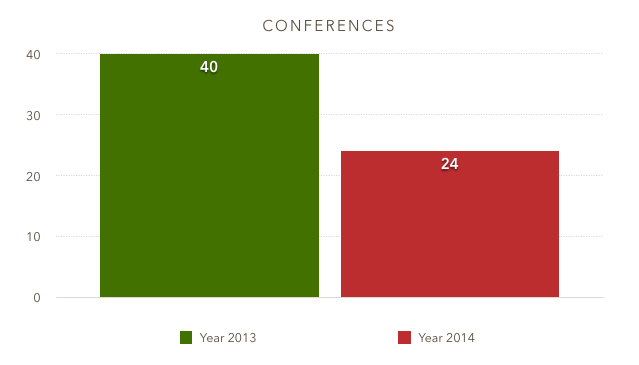 Comparing to 2013, you can see the difference: 24 conferences, 15 user group meetings & 40 presentations. PASS Business Analytics Conference 2014 (7-9th of May 2014) – I have delivered a session together with Scott Stauffer on the Managing Your Alibi with Social Media. Foursquare, Facebook, Twitter & PowerBI! SQLSaturday #341 Port-wine edition Portugal (18th of October) I have delivered a Deep Dive session on the ETL patterns with Clustered Columnstore. For the complete list of my presentations, feel free to visit the Events Page. My goal for 2015 is clear – to lower the number of conferences further, to make more sense with less running around. To become more effective.